Dreaming of France: parlez-vous français? I get such a kick out of hearing Alex Trebek using his perfect, if ever so pedantic, pronunciation of French on Jeopardy. French isn’t a language I hear too much of in Los Angeles, Trebek’s occasional forays into French on Jeopardy are often the only time I hear the language in any given week. In LA, it’s Spanish that informs a huge part of the soundtrack of my life in the city. I hear it on the streets, in the stores, in restaurants and on television stations like HBO Latino where I stumbled onto Judi Dench speaking Spanish on the Tracy Ullman Show a couple of days ago. Turned out it wasn’t Dench at all, it was Ullman channeling Dench; something I might have figured out for myself if the program had been in English. Despite living in Puerto Rico for a year when I was fifteen, despite studying Spanish for four years in high school, my Spanish is mediocre. Hola. Donde esta la biblioteca? I can ask where the library is in French too, but my Français is much, much worse than my Spanish. And that bugs me. My father was fluent in French. Actually he was also fluent in Spanish and Italian, all self-taught. I learned early on—after taking French,the required language, in middle school in Canada—that I hadn’t inherited his linguistic knack. That hasn’t stopped me from trying. Before I took my two and a half month trip to Europe, landing in Paris way back in the 1980’s, I took a night class so I could at least get by once I got to France. I re-learned enough to ask for directions, the cost of a hotel room, the price of a meal, a souvenir. All the usual traveler’s questions. The words were a little trickier when my travel mate got a yeast infection. Finding a pharmacy—Où se trouve la pharmacie?—was simple. Describing her symptoms? Definitely not. 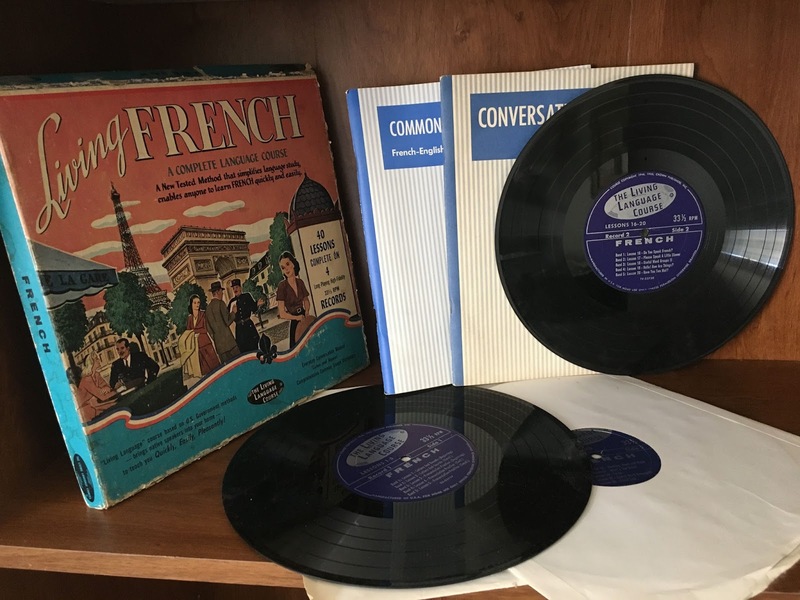 Somewhere along the way I picked up this Living French language course, complete on 4 long-playing, high-fidelity 33 1/3 RPM records. A vintage piece of vinyl now, the course was new when I bought it. Lesson One goes over letters and sounds and covers the three different accents: acute, grave and circumflex. Circumflex? That tidbit from lesson one is as foreign to my ears as learning a language via an LP would be to the average millennial. We don’t own a record player anymore, we gave up our stereo long ago, but for some reason I can’t seem to shed the heavy albums. I unpacked the set for the picture, but they sit at the bottom of my bookshelf, where the rest of my old albums are stacked. Joni Mitchell’s Blue, Cat Stevens’ Tea for the Tillerman, Bruce Springsteen, Elton John, Billy Holiday, Bowie, the Beach Boys and the Beatles, collectively and individually. Streisand and Sinatra. I don’t know why I don’t give them up. Put them on eBay. See what I could get for them at Amoeba. But I don’t. I keep them around, souvenirs of something, someone I once was. Still am, at my core. Selling them would be selling out, admitting that I no longer believe that anything is possible. I don’t admit that. “Look at Grandma Moses,’’ my mother used to say. It’s never too late. Anything is possible. Even learning French. What dreams are you still yearning to achieve? VISIT An Accidental Blog to connect with fellow francophiles. That's true about vinyl. Maybe I am sitting on a gold mine, To be honest I think new technology w a course via Rosetta Stone or Duolingo is the root to go if I'm going to be serious about it. What a great post Sim! As Paulita says- vinyl is back, don't get rid of your old records... But you may not need to worry about the circonflex all that much longer- even the Academy Francaise is finding it burdensome. Do you have access to tv in French in LA? We do here, and it's great. French is hard, but it's fun to keep persisting. The French really do appreciate it when non-French speakers make an effort, although it seems that more and more English is spoken in Paris each time I visit, which is a bit of a shame, non? Oh, Louise, it's always so nice to hear from you! I guess it's understandable that English is becoming more and more prevalent around the world but oui, it is a bit of a shame. Vive la' difference!